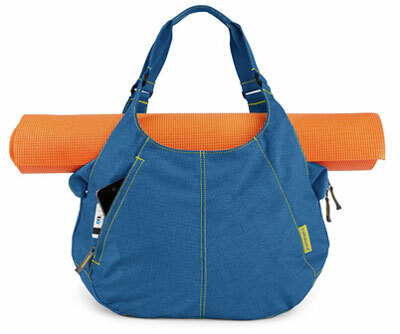 Yoga friendly, recycled PET ripstop fabric, lifetime guarantee. It’s hard not to love Timbuk2 bags. They are built to last, highly functional and utilitarian, built in the USA, and they offer tons of color options to appeal to your personal sense of style. Heck, you can even have a bag custom built. The “Build Your Own Bag” process includes choosing the specific bag style, bag size, plus color(s) and fabric(s), binding color, logo color and liner color. On applicable bag styles you even get to indicated your handedness (lefty or righty). All this personal choice and it ships in 2-4 business days! Pretty amazing. Timbuk2 has been in business over 20 years (since 1989), and is headquartered in San Francisco, CA. Believe it or not, Portland helped propel Timbuk2’s success – our fair city is credited with placing the first wholesale order for messenger bags in 1990. Thank you, Bike Gallery! I am craving one of their newest bags, the Full-Cycle Scrunchie Tote, which is featured as part of their Yoga collection and their Eco-Friendly collection. Constructed of 100% recycled PET materials, the tote is also approved by the Global Recycle Standard. Available in two colors, choose from ripstop blue (shown below) or ripstop gunmetal. Billed as roomy and capable of tackling your gym gear needs, the yoga mat cradle makes this tote truly versatile for the urban lifestyle. Don’t forget that all Timbuk2 products come with a lifetime guarantee. Ready to get a new bag? Timbuk2 also offers the “break up with your bag” program, which allows you to recycle your bag and get 20% off your next purchase. Great incentive for when you are ready for a new style, and your bag will get a new life as it will be donated to someone in need.